The speaker wasn’t really working, so I came in to the offices today to get it fixed… As for the battery, same as last week, every time it runs off, couple minutes later it turns back on, I’ve got full battery again. After Wallace gave her first update last week, I questioned how the OPhone could be reading a full battery just minutes after it had shut off due to low power. Even if Orbo generates power as claimed, it would take longer than a few minutes to fully charge even a small Li-ion battery. [T]he ophone contains a capacitor that directly powers our phone. During extensive use this capacitor may become discharged, however this capacitor is being constantly trickle charged by Orbo. So after a period of time the capacitor will be recharged and the phone will be functional again…To fully recharge the capacitor can take several hours, however enough charge to power the phone back on can typically be achieved within several minutes…[T]he charge characteristics of a capacitor are very different than those of an LI battery. The battery indicator on the ophone is designed for an LI battery, hence it can show fully charged even when the capacitor is not fully charged. The new information here is that the OPhone uses a capacitor, rather than the Li-ion battery that it was said to contain in previous statements by Steorn. This fact makes sense of Wallace’s observation of a full charge indicator just a few minutes after the phone had powered off. The fact that Wallace needed to bring the OPhone back to Steorn for service to its speaker does muddy the already murky waters of her user testimonial a little further. It introduces the possibility that if Steorn is running a scam, they could easily have used such an opportunity (and even engineered the need for such an opportunity into the OPhone given to Wallace) to replace the batteries in the phone, so it could continue to appear to be generating its own power. Wallace’s testimonials so far don’t provide any evidence that Steorn is running a scam, but they are so poorly controlled that they don’t provide evidence for Steorn’s claims either. I suppose their real purpose is not so much to provide evidence as to generate interest, anyhow. I received a report from a longtime reader in Dublin who spoke yesterday with Jennifer Roe, the other friend of Steorn who is testing an OPhone for them, at the bar where she works. According to his report, Roe said that her OPhone worked fine for 5 days, without ever shutting down and recharging as Wallace’s has. It then went dead. She said that Steorn will be coming out to her today to fix it, and that she’ll then post an update on the Orbo Facebook page. As with Wallace’s use of the OPhone, the reliability of Roe’s test is compromised by the need for Steorn to modify the phone after the test has begun. This is a new product in a very early stage, so unforeseen problems are expected. But if these phones keep having to return to home base every week or so for some kind of tune up, then a suspicious pattern emerges. In other news, Frank Acland’s OCube tests have yet to produce encouraging results. After initially being able to light an LED lamp for long periods of time, it has gradually been reduced to lighting the lamp for shorter periods and now just brief flashes, and requires longer intervals between attempts in order to produce any light at all. Again, because (according to Steorn) Acland was incorrectly shipped an OCube that was undergoing testing with a capacitor in place of the standard Li-ion battery, it’s unclear what is responsible for its faulty behavior. Acland did finally succeed in removing the OCube’s lid, however. 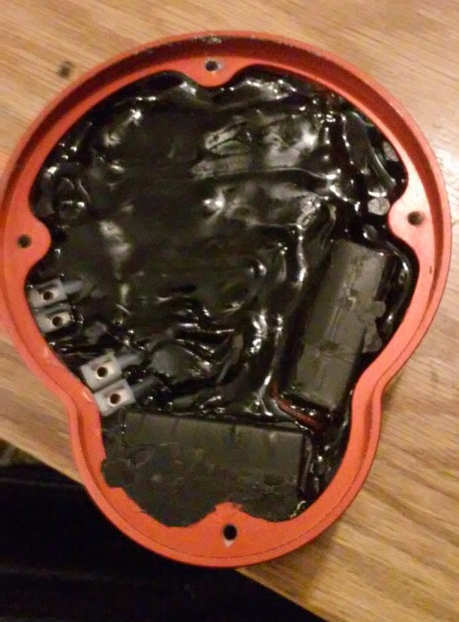 Unfortunately, this revealed that his OCube has been “potted”, meaning it’s been filled with a substance (probably epoxy resin) that prevents access to its components. This is often done to protect electronics from moisture and vibration, as well as to prevent prying eyes from stealing intellectual property. That may be the purpose here; though a more suspicious reading is that this was done to prevent the device’s fraudulent workings from being revealed. Whatever the purpose, the potting makes it virtually impossible to isolate and test the Orbo powerpack on its own. Steorn told Acland that if he removed the back lid, he would have access to a set of terminals that do connect directly to the Orbo powerpack. In fact, opening the lid exposed two different sets of terminals. In the best case scenario, one of these sets will connect directly to the Orbo powerpack, and Acland will be able to measure any power that it generates, without interference from the capacitor or any other intervening components. Testing this out is the next step for Acland, so we should get results soon. When Shaun McCarthy first described the OCube, he talked about it as something that buyers could and would tear apart, and put to the test however they would like. Since then, it seems Steorn has had a change of heart. The one OCube known to have shipped is filled with epoxy and has a sticker on the inside of the lid saying “Warranty void if removed.” They’ve behaved like this in the past as well. They never demonstrated clearly working devices to the “jury” of scientists and engineers that they themselves enlisted, and they held back important information from the SKDB, the community of engineers they put together with the stated purpose of testing, replicating and further developing their claims. Why does Steorn repeatedly seem to hold back when just on the verge of providing concrete evidence that they have a revolutionary new technology? To a cynic, the answer is obvious: they simply have nothing to show; they can’t provide evidence of something that doesn’t exist. That may be true. Another possibility is that this behavior comes from a strong concern about losing control of their intellectual property. As soon as they’ve given out enough information to allow others to replicate their effect, the cat is out of the bag and without patent protection (which is not granted to devices that purport to generate free energy) any company could produce copycat Orbos. If anyone at Steorn is reading this, and if in fact you do believe that Orbo works as claimed, please reconsider this strategy. If the Orbo does generate energy, a few millimeters of epoxy will not get in the way of companies determined to uncover how it works. But that epoxy, and the attitude of secrecy that it represents, is actively hindering people who want to find out if Orbo works, who are hoping to find evidence that it pulls off the miracle you claim it does. As I understand it, Steorn’s reserves are running short and its ability to keep itself afloat depends on Orbo being taken seriously in short order. There are probably thousands of people who’ve been following your story, who want your claims to be true, who just need to see concrete evidence for themselves. Sell them, sell us your power cells directly so we can run the simple tests that will tell us whether they work — and then find all kinds of applications for them. Once they’re out there, if they work, there will be no end to the noise people make about them, and the products people will want to license them for. Sealing them up in epoxy won’t keep their workings secret, but will deter honest attempts to find out whether they work at all. Unless that’s just what you want, I hope you will reconsider. Come on guys. If it looks like a lemon and tastes like a lemon, it’s unlikely to be anything but. A couple of times Shaun has been quoted as saying that the ability of the company to be maintained going forward is wholly dependent upon the goodwill and belief of the shareholders and them investing more money in the company. That popped out as more of a point that was suggesting that he would be happier with the investors ‘believing’ that the ‘best attempt’ had been made at marketing the product and it having failed, chalking up the loss to ‘life’, and moving on, everyone the ‘wiser’. After 15+ years, I can’t imagine a happier outcome for someone who hadn’t actually made the product that has been touted. I reckon that is his end game, hence him having a couple of reference users who are using it ‘as advertised’ while the real testers getting blocked and stymied at every turn. Create a muddle, let it die in a very messy, confused fashion, and plug that one idea that it was a non-hit that should have been. It also seems strange that they moved the orbo from mechanical to eventually electrical other than to obfuscate people potentially finding out how it didn’t work. One of the funny things is the level of intelligent people who are following this. It has continued over a significant segment of our lives which makes it a nice event. It’ll be a shame for it to fade away after this. There are no solvents for the epoxy that would help him remove it? I feel quite confident that that “jury” was not going to come back in favor of Steorn under any circumstances. They would have found (or made) a way to creatively interpret the findings to be against Steorn. Did reason matter when respected academic psychiatrist John Mack shot his reputation to hell by coming out, publicly, and claiming that he believed that some people really are getting abducted by aliens? Of course not. Most everyone just used whatever stupid excuse they could think of to dismiss him – many without even looking at his evidence and reasoning. Well, it was the same with that “jury.” Those “jury” members weren’t about to admit, at risk to their personal reputations, that they, and centuries of mainstream scientific wisdom, had been wrong. Christ, one of those “jury” members, Michio Kaku, called the Steorn dudes frauds on national television without even knowing much about Steorn! I think that the Steorn dudes were not smart to think that there was anything greater than a snowball’s chance in hell that the “jury” was going to rule in favor of Steorn, and I think that Shaun kinda sorta admitted that when Shaun said that the Steorn dudes wasted years trying to convince the scientific community when the Steorn dudes should have been focusing on the end user. Another point that I want to make is that I think that we should be cautious about drawing conclusions about the “real” oCubes by looking at Acland’s “test subject” oCube. That makes me think about your oCube, Michael, and a question. So, Michael, are you planning on opening up your oCube? 1) The head of the jury, Ian MacDonald, has been very open about his experiences on the jury, and for a while was an active member of a forum that discusses Orbo (see http://www.moletrap.co.uk/forum/search.php?PostBackAction=Search&Keywords=ian+macdonald&Type=Comments&btnSubmit=Search). The impression I got from what he said is that he and the other members were willing to accept Steorn’s claims if shown evidence. Steorn seemed to expect that the jury members would replicate Orbo on their own, based on Steorn’s instructions, to prove it to themselves. Before committing that level of time to the project, though, the jury asked to be shown a working Orbo. They even traveled to the Steorn offices once for the demonstration, but the Orbo wasn’t working that day. According to them, they were never shown a working original Orbo (perpetual motion type). It’s a matter of opinion, but I think the jury was honest and would have given a positive verdict if allowed to test a working device. 3) If Orbo works it should have a huge advantage in winning over scientists compared with alien abductions, because Orbo is completely replicable. When (and if) there are thousands of Orbos in the world and they each just keep producing energy indefinitely, it would be extremely difficult to deny. Alien abductions, true or not, can’t be replicated or tested on demand. 4) Michio Kaku was quoted talking about Steorn in an ABC News interview, but was not on the Steorn jury. To answer your question, my original plan was to open up my OCube, and test just the Orbo powerpack itself, leaving out the battery. If all the OCubes are potted, that won’t work. So what I do will depend on the situation when (and if) I receive it. I’m sorry about the Michio Kaku thing. I thought that I read that he was a part of the “jury.” Well, since you are more familiar with the events then I am, I will defer to your opinion, at least partially. I will defer to your opinion when you say that the Steorn dudes did some things that they should not have done. I won’t agree, though, that it is likely that the “jury” would have done the right thing and claimed evidence of overunity, even if the Steorn dudes did everything that the “jury” wanted. Also, while I will agree that easy replication helps, I will not agree that it is enough to sway determined disbelievers. The mainstream scientific community has become a community of determined disbelievers in overunity, and they have been that way for centuries. However, I will agree that if tons of oCubes have flooded the market then the scientists will change their minds, but not because they have “seen the light,” so to speak, but because they will fear that if they don’t change their minds (or lie, publicly, and say that they changed their minds) then they will lose credibility with the general public. As much as they like to think that they are in an ivory tower,, most of the scientists and academics realize that they do need a certain amount of support from the general public. If they don’t get it, there will be negative consequences, up to and including a loss of their jobs. I don’t really have any idea why Streorn is doing that inaccessibility to the components but, it might be that it is to protect the investors interest as much as it is possible in a way that is transparent to the investors as such. If I had a lot of money that I had invested in the Ocube and other Steorn gadgets I would expect Steorns company to do just what he is doing. Even if it is a realistic expectation that others will tear the devive apart in the attempt to copy it. I would as many obstacles as long as possible to prevent others from taking away from the market that is currently wide open only for Steorn. I agree that Steorn needs to protect their investors’ interest, but if their attempts to protect the intellectual property prevents people from ever concluding that Orbo works as claimed in the first place, then Orbo never finds a market and Steorn, its investors and everyone else loses out. I’d like to expand on a point you made: Steorn’s possible fear of losing its intellectual property and other companies building copycat Orbos. In a sense, no greater thing could happen to Steorn. The Steorn controversy has never been about intellectual property rights, about who first came out with the marvelous free energy device that ended up saved humanity. It’s been about whether there is anything there in the first place, about convincing a deeply skeptical public and scientific community that free energy is real and possible. Let’s say Orbo devices work as intended, but the tech is quickly (say after a year) duplicated by other companies which then flood the market with free energy gadgets. Let’s assume a worst-case scenario wherein up to this point, even though thousands of working Orbo gadgets are out there in the hands of skeptical journalists, physics and engineering professors and perhaps politicians, the reality of free energy still hasn’t broken through the wall of official denial and Orbo is still only discussed on speciality blogs, or mentioned by the occasional mocking newspaper story as a certain scam that’s gotten a little out of hand lately. Then the copycats would be doing Steorn a favor- they help it do something which it still hasn’t been able to do on its own power, which is, reach a critical mass of awareness that forces the political, scientific and economic elites and the mass media to acknowledge the reality of this phenomenon. Once there is front page coverage and mainstream legitimacy, the issue of who invented it first would be sorted out quickly. Mr. McCarthy and his engineers would instantly be world celebrities, and barraged with offers for public speaking engagements, book contracts and lucrative job offers from governments and hi tech companies who all want the expertise of The People Who Changed Physics And Humanity Forever. Given the stakes, concerns about intellectual property seem petty and missing the big picture entirely. I agree, and Shaun seemed to be thinking this way too in the shareholder video a few months ago, when he was talking about how their best bet is to build a brand, so that their technology will be linked to the name Steorn and people will go to them to get the “real thing” even once copies are available.